Our Middlefield Collection defines the term "rustic modernism". 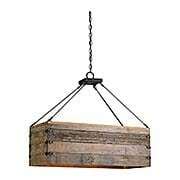 Bold in nature, each piece is crafted from wood, bleached and distressed to resemble barn boards, while solid steel straps, bars, and candles are faux-finished with an aged rust patina. Rugged, yet clean-lined, this look is suited for cabins, Colonial, and contemporary homes alike! 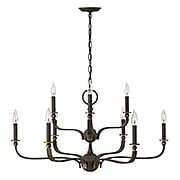 The Rutherford 8-Light Chandelier is a modern interpretation of classic Colonial design. Recalling the charm of Williamsburg, its elegant arms extend confidently from a cast sphere and are topped with traditional candles sticks. 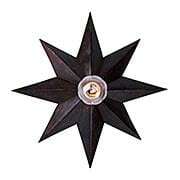 With an oil-rubbed bronze finish, it complements a variety of decors. 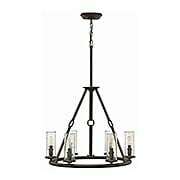 The Rutherford Collection is a modern interpretation of classic Colonial design. 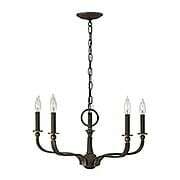 Recalling the charm of Williamsburg, this scone's elegant arms extend confidently from a cast sphere and are topped with traditional candles sticks. 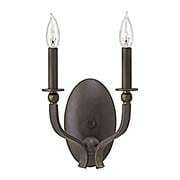 With an oil-rubbed bronze finish, it complements a variety of decors. 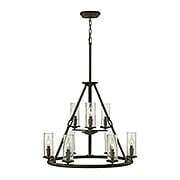 The Rutherford Two Tier 9-Light Chandelier is a modern interpretation of classic Colonial design. Recalling the charm of Williamsburg, its elegant arms extend confidently from a cast sphere and are topped with traditional candles sticks. 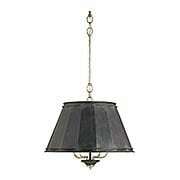 With an oil-rubbed bronze finish, it complements a variety of decors. 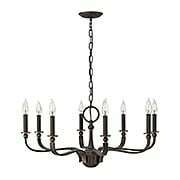 The Rutherford 5-Light Chandelier is a modern interpretation of classic Colonial design. Recalling the charm of Williamsburg, its elegant arms extend confidently from a cast sphere and are topped with traditional candles sticks. 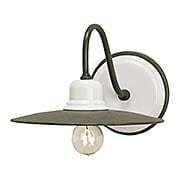 With an oil-rubbed bronze finish, it complements a variety of decors. Stately and elegant, the French-inspired Eathorpe pendant brings a sophisticated edge wherever it resides. The blacksmith finish of the fluted-metal drum shade contrasts beautifully with its silver-granello interior. 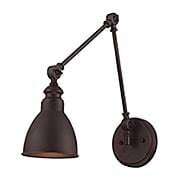 This large, downward light is perfect for illuminating a table or island. 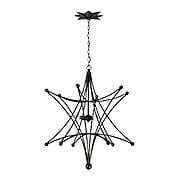 The Astro Collection offers a modern twist on the classic Moravian star. Popular as a wood or paper ornament in the 19th century, this dynamic shape takes an exciting new direction in skeletal wrought iron. 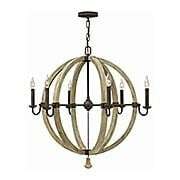 This large chandelier features four interior lights, a star canopy and a deep, English bronze finish. An eye-stopping addition to your dining room or foyer! Reminiscent of pharmacy lamps of the past, the Dakota Collection is a study in early 20th-century style. 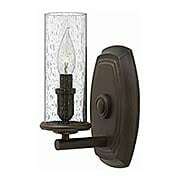 This adjustable wall sconce features sleek lines, a classic bell shade, and comes in an array of classic finish options. Whether it is placed above a project table, desk, or work bench, it offers bright, targeted lighting exactly where you need it. Tradition with a twist! 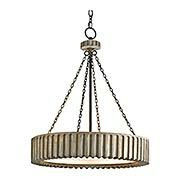 This Colonial-style pendant gets a fresh update with industrial accents. Metal straps and buckles accentuate its traditional seedy-glass hurricane shades and metal candles, while a rich bronze finish completes the look. What a handsome addition to period interiors. Tradition with a twist! This Colonial-style wall scone gets a fresh update with industrial accents. 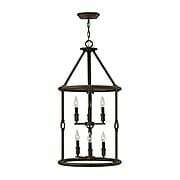 Metal straps and buckles accentuate its traditional seedy-glass hurricane shade and metal candle, while a rich bronze finish completes the look. What a handsome addition to period interiors. 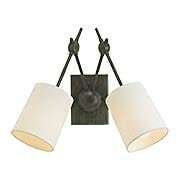 Suited to modern and traditional farmhouses alike, this charming fixture delivers quintessential early-American style. Its Hiroshi-grey, wrought-iron frame accentuates its white porcelain elements, making it as versatile as it is functional. 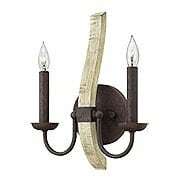 Uncomplicated and timeless, the Eastleigh wall sconce is both pure and pleasing. The architecturally-inspired Compass wall sconce brings a simple, clean look to traditional and contemporary interiors alike. A warm Cupertino finish graces the wrought iron arms and backplate, while crisp, white-linen shades create a refined contrast. 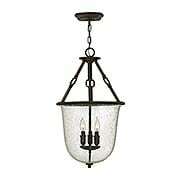 It's a fitting fixture for hallways, entryways, or dining rooms. Antique inspiration furnishes this rough luxe design with authenticity and style. 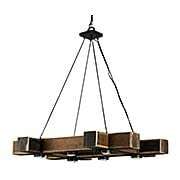 Gorgeous natural-aged wood is pieced together with riveted, wrought-iron hardware, giving the Billycart chandelier a wonderful farmhouse aesthetic. 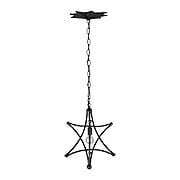 Suited for hanging over a table or island. 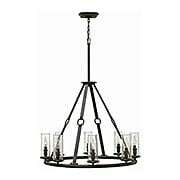 Like its namesake, the Dockyard Chandelier delivers rustic, industrial design. 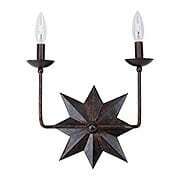 Its reclaimed wood frame, wrought-iron accents, and blacksmith finish come together to create this handsome design. Whether displayed in your dining room, bedroom, or over a kitchen island, it emanates a warm glow. 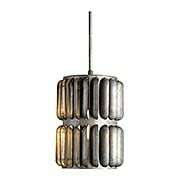 Inspired by gears of the industrial era, this finely crafted pendant commands attention wherever it resides. The carved wood construction is given old-iron and washed gray finishes, adding to its industrial luxe look. It is a dynamic choice for your living room, bedroom, or kitchen. 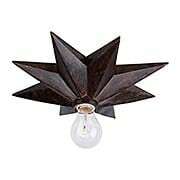 This painted wood and tin wall sconce is a wonderful choice for colonial style interiors (as well as country cabins!). 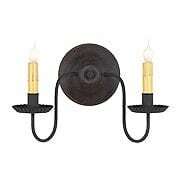 Offered in an array of rustic colors, it features dripping candles and crimped tin cups with a textured black finish. Formal enough for the living or dining room, it also works well in a powder room or kitchen. Handcrafted in Pennsylvania. Inspired by wind turbines of the industrial era, this finely crafted pendant brings powerhouse style and intriguing light patterns, wherever it resides. The wrought-iron construction is given a cool Hiroshi Gray finish, a great look for restoration-themed rooms. It's also a dynamic choice for living rooms, bedrooms, or kitchens. 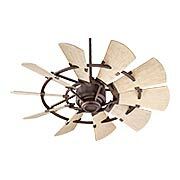 The Windmill 44-Inch Ceiling Fan brings rustic Americana nostalgia to your decor. With two classic finish options, galvanized and oil-rubbed bronze, it's sure to attract attention. The Windmill 52-Inch Damp-Rated Ceiling Fan brings rustic Americana nostalgia to your decor. With two classic finish options, galvanized and oil-rubbed bronze, it's sure to attract attention. UL Damp rated for covered exterior use. 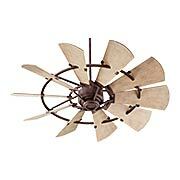 The Windmill 44-Inch Damp-Rated Ceiling Fan brings rustic Americana nostalgia to your decor. With two classic finish options, galvanized and oil-rubbed bronze, it's sure to attract attention. UL Damp rated for covered exterior use.